South Puget Sound Community College (SPSCC) today announced that SPSCC president Dr. Timothy Stokes was awarded the 2018 Pacesetter of the Year award by the National Council for Marketing and Public Relations (NCMPR), District 7. 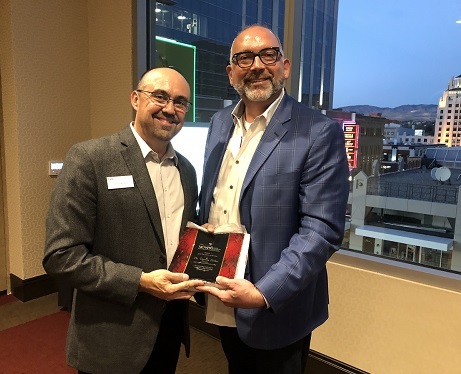 He was recognized at an awards ceremony at the NCMPR District 7 conference in Boise, Idaho, on Thursday, Oct. 11, 2018. The NCMPR Pacesetter of the Year award recognizes a community college president or CEO who has demonstrated special leadership and support in college communications and marketing. It is awarded annually in each of NCMPR's seven districts. The district award automatically qualifies Dr. Stokes for the national award; his nomination will compete with six other district awardees at the NCMPR National Conference in San Antonio, Texas, in March 2019. NCMPR District 7 includes Alaska, Idaho, Montana, Oregon, Washington, and the Canadian provinces of Alberta, British Columbia, Saskatchewan, and Yukon Territory. Dr. Timothy Stokes with NCMPR District 7 Director James Walters, Director of Marketing and Communications, Skagit Valley College.